This week we will wrap up our series on nuclear fusion by taking a look at one possible scenario for the future of fusion and how it could eventually play a part in ending our reliance on oil and natural gas. helium-4 atom and two protons plus energy. Even though nuclear fusion does not produce radioactive waste directly, it does produce neutron radiation which does require shielding. But some fusion reactions are aneutronic. One such reaction is a pure reaction of helium-3 where two He3 nuclei fuse to create one helium-4 nucleus and two protons. 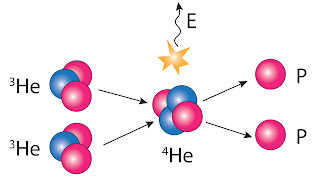 Since the protons are electrically charged, they can be contained by an electric or magnetic field. And it gets even better, because by containing these protons it would be possible to convert this energy directly into electricity, bypassing the need to heat water and create steam which runs through turbines which then powers electric generators. But there are some problems, the biggest of which is that helium-3 is virtually nonexistent here on Earth. Our closest source for helium-3 is on the Moon, which has sparked a new space race which may one day lead to mining on the Moon. China, Russia, India, Japan and Germany have all declared their intention to make it to the Moon with the intent of eventually mining helium-3 and bringing it back to use as fuel for fusion reactors here on Earth. NASA, too, is scheduled to be on the Moon by 2020 and to have a permanent base by 2024. And while NASA has not specifically come out and declared an intention to mine helium-3, it does have advocates of helium-3 mining in influential positions. The other problem is the extreme temperature required in order to begin a fusion reaction of pure helium-3, which is estimated to be six time hotter than the interior of the Sun. The only research facility currently doing successful helium-3 fusion reactions is at the Fusion Technology Institute at the University of Wisconsin-Madison, where they have been able to confine the reaction with a technology known as inertial electrostatic confinement (IEC). The benefit of IEC is that it doesn’t need a massive confinement structure—their experiment is table-top sized. It is estimated that we are 50 years away from creating clean fusion energy, but the potential advantages are so great there is no doubt that research will continue and possibly one day in the not-to-distant future clean energy will be more than just a dream.